One Pot Chicken Cacciatore + Good Cook Kitchen Drawer Event! A comforting and flavorful one pot meal, perfect for any night of the week! I'm super excited to share with you a fantastic promotion that Good Cook has going on right now! 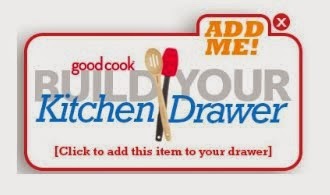 The Build Your Kitchen Drawer Sweepstakes offers participants the chance to stock your kitchen drawer with kitchen tools of your choice. If you don't want to pick your own drawer, you can view the drawers of all the bloggers involved in this promotion and enter to win those tools. The official sweepstakes starts on June 2nd so be sure to come back and see what I picked as my dream Kitchen Drawer! As an introduction to this promotion, the Good Cook sent me five of their most popular kitchen tools and asked me to come up with a One Pot meal. The five tools I received were the SMART Ice Cream Scoop, Flip Measuring Spoon, Safe-Cut Can Opener, Egg Separator and Pot Clip Holder. As I sat and thought about what to make, I immediately thought of comfort food. So I knew I wanted an easy, one pot meal that was totally comforting. What I came up with is this delicious, warm and hearty Chicken Cacciatore. It's easy to prepare and healthy too. And who doesn't love a one dish meal? Less dishes to wash afterwards! Heat a Dutch oven or large pot over medium heat. Add half the chicken thighs and cook until browned on both sides, turning once. Transfer the browned chicken to a plate and repeat with the remaining chicken. In the same pan, increase the heat to medium-high and add a half tablespoon of the olive oil. Add the mushrooms and cook until softened and browned, about 8 minutes. Transfer the mushrooms to a bowl and set aside. Add the remaining half tablespoon of oil to the pan and add the onions, pepper and garlic. Continue to cook on medium-high, stirring occasionally, until the vegetables are golden brown and softened, about 4 minutes. Pour in the wine and bring to a boil. Cook until the wine is almost evaporated, about 3 minutes. Add the crushed tomatoes and broth and return the chicken to the pan. Simmer until the meat is tender and sauce is thickened, about 1 hour. Stir in the mushrooms and cook an additional 15 minutes. Season with salt and pepper, to taste. Serve the chicken and sauce over rice or noodles. I was able to try a few of my new Good Cook tools to make this dish. I used the Flip Measuring Spoon to measure out my minced garlic. I love this tool because it replaces all of my measuring spoons! Instead of searching my kitchen drawer for the right sized spoon, the Flip Measuring Spoon has everything I need in one tool as it measures 1 tablespoon, 1 teaspoon and 1/2 and 1/4 teaspoon. I also used the Safe-Cut Can Opener to open my can of crushed tomatoes. I LOVE this can opener! So much easier, and safer, than the can opener I had before. It cuts around the lid and leaves no sharp edges whatsoever. Lastly I tried out the Pot Clip Holder and it quickly became one of my favorites! The tool clips to the side of your pan and holds your spoon when you're not stirring. No more messy spoon rests or countertops!